On Thursday July 25th 2013, Trustee Joy Palmer Cooper and the Volunteer Team 2013 celebrated the official opening of the village agro-drinking well at Hippola. 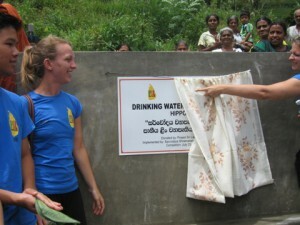 This well was financed by the fund-raising of Team 2013. It was a wonderful day, when the village people realised the transformation of their lives now that water was available within their community for personal and agricultural uses and for the Temple. The volunteers had the great privilege of staying for 2 nights in homes of Hippola residents, sharing in cooking and eating of genuine local dishes and finding out far more about the families for whom they had provided a water supply. They will never forget this wonderful ‘in community’ experience.